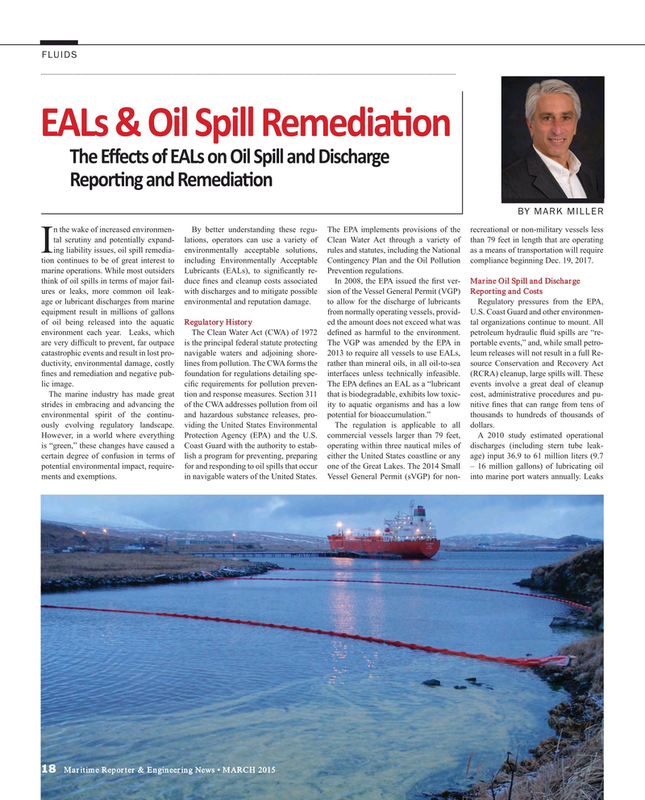 Iing liability issues, oil spill remedia- environmentally acceptable solutions, rules and statutes, including the National as a means of transportation will require tion continues to be of great interest to including Environmentally Acceptable Contingency Plan and the Oil Pollution compliance beginning Dec. 19, 2017.
marine operations. While most outsiders Lubricants (EALs), to signi? cantly re- Prevention regulations. The marine industry has made great tion and response measures. Section 311 that is biodegradable, exhibits low toxic- cost, administrative procedures and pu- strides in embracing and advancing the of the CWA addresses pollution from oil ity to aquatic organisms and has a low nitive ? nes that can range from tens of environmental spirit of the continu- and hazardous substance releases, pro- potential for bioaccumulation.” thousands to hundreds of thousands of ously evolving regulatory landscape. viding the United States Environmental The regulation is applicable to all dollars.